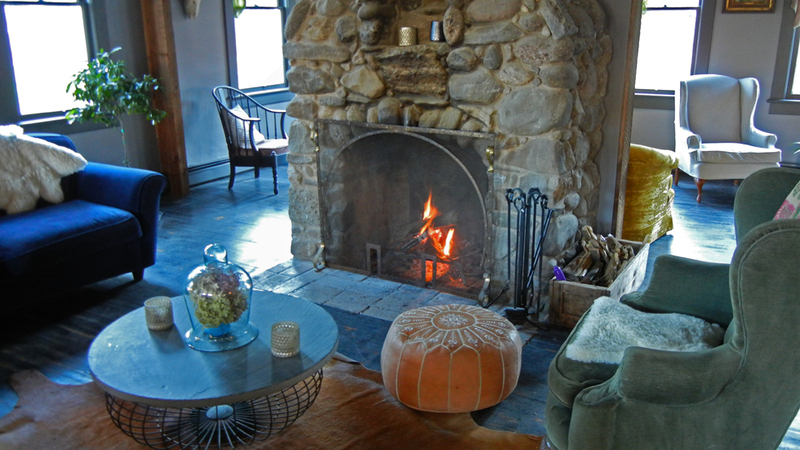 The Catskills’ historic old inns have long held a reputation as picture-book country retreats, where visitors fresh from skiing, hiking and fly fishing could curl up with a cup of coffee to read in front of the fireplace. At the same time, many of the grand old buildings that helped create that reputation fell into disrepair over the last half-century, unkempt and often abandoned. As a new generation of tourists from Brooklyn and beyond have begun to appreciate the region’s many attractions, however, a growing number of small-scale, old-fashioned Catskills inns are being reborn under enterprising new owners. These days, the coffee might be cold-brewed in state-of-the-art equipment, and the novels and newspapers probably come in digital form, over the wifi. The food and beverages in the dining room are increasingly locally sourced. The word-of-mouth advertising spreads by hashtag. Two fresh examples of this trend, Mount Tremper’s Foxfire Mountain House and Youngsville’s Clair Inn & Cafe, are preparing to throw open their doors this winter after large investments of money, time and elbow grease by owners who couldn’t resist the urge to try their hands at combining vintage Catskills charm with modern-day hospitality. The two ventures join an emerging market that includes The Arnold House and The North Branch Inn, two Sullivan County revamps by the same owners, which launched in spring 2014 and fall 2015, respectively. In the northern Catskills, this summer brought new owners and total reboots of Captain’s Inn at Point Lookout and Hammo’s Brewpub & Lodge, both near the Greene County ski town of Windham. Eliza Clark, a television director and producer, and Tim Trojian, a chef, bought the 100-year-old building now known as Foxfire Mountain House in April 2013. They purchased it from the Emerson Resort and Spa, which sits just across Route 28 and had used it for staff housing until 2008. After two years of renovations, Foxfire has been in soft-open mode for a few months, hosting a handful of weddings this summer and operating a three-bedroom cottage adjacent to the lodge as an Airbnb rental. Clark and Trojian are now putting the finishing touches on the last four of 11 guest rooms in the main building, and wrapping up the build-out of the commercial kitchen. The lodging accommodations are just about complete; the couple aims to open the restaurant by the end of January. Guided by Clark’s director’s eye, the decor is rustic but spare, with high ceilings and hide rugs complemented by artfully arranged flowers and an eclectic collection of vintage objects. Outside, Foxfire’s amenities include hammocks, horseshoes, bonfires and a lily pond in an old swimming pool that converts to a skating rink. Meanwhile in Youngsville, a hamlet of the town of Callicoon, proprietor Randy Klocko has transformed the former Hotel Clair into a modern inn, restaurant, coffee house and tap room. The historic building, built around 1920 after a previous inn burned on the same site, had most recently functioned as a bar and liquor store. It was shuttered for more than a year when Klocko bought it in July. He plans to open his 50-seat restaurant this month; the inn’s four upstairs guest rooms are scheduled to come online this spring. The Clair’s restaurant will serve seasonal, casual American dishes for breakfast and lunch Tuesday and Wednesday, and add dinner on weekends. The bar’s showpiece is a 10-tap draft system: nine lines for local beers and one that dispenses cold-brew coffee made and kegged in-house on a system set up by the Hudson Valley’s Irving Farm Coffee Roasters team. Both sets of new innkeepers came to the Catskills from elsewhere, drawn by a lot of the same attractions that have sparked a resurgence in the region’s tourism, including a destination wedding boom. Clark, who’s Canadian, and Trojian, who grew up with a family house in the Finger Lakes and worked as a chef at Whiteface Lodge in the Adirondacks, had settled in Toronto after marrying. But their careers put them on different schedules, with Clark on the day shift and Trojian working nights helming the kitchen at the InterContinental Hotel. They began considering a life change and looking for a business they could build together. Clark’s grown daughter happened to travel to Woodstock for a Neko Case concert around the time the pair were exploring possible destinations, and convinced them to give the Catskills a chance. Klocko came east from Palm Springs, California, to settle a relative’s estate. Charmed by the Sullivan County landscape, he and his partner decided to stay in the family home. Once ensconced there, Klocko — whose background is in design and remodeling — realized he couldn’t watch the gracious old inn across the street fall into disrepair. To join the 21st century, both of the properties faced their own particular renovation challenges, from sagging floors and roofs to septic-system issues and building code regulations. Foxfire’s main building had to be jacked up to add and replace load-bearing beams. A beautiful free-standing fireplace was boarded up behind drywall. Clark and Trojian did all the work themselves, sourcing materials from the Ulster County Habitat for Humanity ReStore in nearby Kingston, Craigslist and local junk and antique dealers. “I can count on one hand the number of things we bought brand-new,” Trojian said. One major cosmetic change at Foxfire was to the entrances. The expansive 80-foot-long veranda facing Mount Tremper, just across Route 28, was rotting, and the side of the building that greeted guests upon their arrival was not particularly welcoming. Clark and Trojian repaired the main porch, converted and expanded an existing mudroom to create a second porch, and then tiled both of them with Moroccan tiles cobbled together from odd lots from a Brooklyn warehouse. Trojian had never laid tile before; he good-naturedly points out how the workmanship improves progressively from one end of the veranda to the other. All the while, the pair pinched pennies and fought cash flow issues, with Trojian taking television jobs in the city — often running reality shows featuring home remodeling and design — to replenish their funds as needed. “I’d get a paycheck for a project and automatically start calculating in my head how many bags of concrete it would buy,” Clark says. After taking over the Clair, Klocko added a large deck and gave the entire exterior a facelift, scraping peeling paint and applying new colors while keeping the charm of earlier eras. He even rescued some of the Hotel Clair’s original signs. Inside, new lighting, paint and furnishings complement the original architecture and vintage bar. “Whatever I’m doing, I want it to be like what it is, but with modern touches,” Klocko said. The new inns’ owners have all enthusiastically embraced the quirkiness and charm of their ancient buildings, searching high and low for the “bits and bobs,” as Clark says, needed to bring it all together.